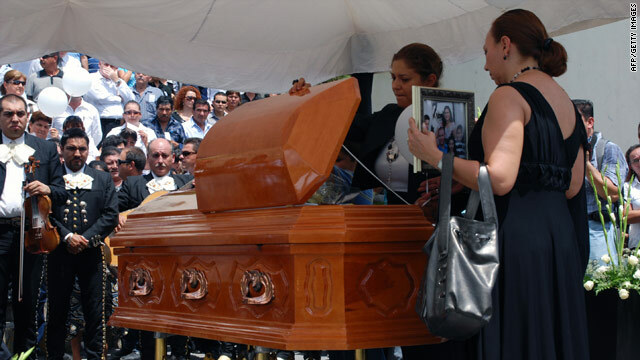 The relatives of Edelmiro Cavazos, Mayor of Santiago, attend his funeral, in Santiago, Mexico on August 19, 2010. Mexico City, Mexico (CNN) -- Five police officers and a transit worker have been arrested in the abduction and killing of a mayor this week in the Mexican border state of Nuevo Leon, the state's governor, Rodrigo Medina de la Cruz, announced Friday. The bound and blindfolded body of Santiago Mayor Edelmiro Cavazos Leal was found Wednesday, two days after his abduction. "The investigation is just beginning," Medina de la Cruz said. Four of the police acted as lookouts on a major road out of Santiago, while the fifth participated in Monday's early morning abduction, said Alejandro Garza y Garza, attorney general of Nuevo Leon. The mayor's bodyguard also was involved in the abduction, Garza y Garza said at the news conference. Authorities are looking for at least four other suspects, the attorney general said. Garza y Garza identified the suspects in custody as police officers Homero Lopez Silva, Monica Martínez, Antonio Rodriguez Gallardo, Mauricio Roberto Mayorga and Jose Alberto Rodriguez Rodriguez, as well as transit worker Jose Javier Garcia Martinez. Rodriguez Rodriguez worked as the mayor's bodyguard, officials said. He was abducted along with the mayor but was let go a few hours later and reported the crime to state officials, authorities said. It was not clear Friday what role he is suspected of having played in the abduction. CNN's Tanya Soto contributed to this report.